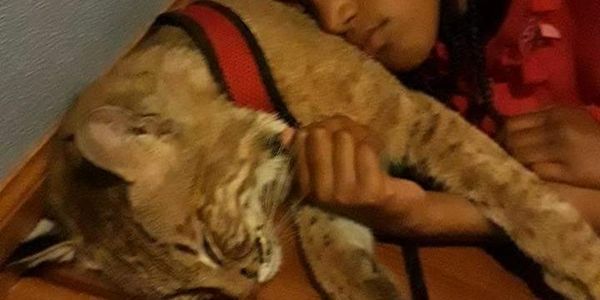 The Mayweather family obtained the necessary permit for their bobcat from the state of Illinois before they purchased him from a breeder when he was just a kitten over 2 years ago. They paid to renew their permit each year. The last renewal was this past January. They have provided him the best home humanly possible. He is fed a diet of meat sold for human consumption. He is loved and cherished by Kesha, her husband and 2 children 10 and 17 yrs old. Last week Illinois state agencies arrived with a warrant and ripped Capone from the only life he has ever known. They claimed that he is a dangerous animal even though he was born in captivity and completely and totally domesticated. He was neutered before he had the opportunity to go into heat and Kesha had him declawed because she was afraid she would hurt him when clipping his nails. Capone is truly a gentle giant because even though he is large in size he is timid, trusting of humans and afraid of many things that do not scare the typical housecat. Danyia is 10 years old and has been pictured reading to him and using him as a pillow when she rests. A.J. is 17 and Capones best friend and playmate. This family pet has had regular vet visits and has never harmed a human being. Why did the state of Illinois issue and renew permits for an animal that is not legal in the state. The family is devastated beyond words and this poor cat must be terrified and confused. Please help return Capone to his loving family that misses him desperately.